Michael David Stevens (born January 23, 1986) is an American educator, public speaker, comedian, entertainer, editor, and Internet celebrity, best known for creating and hosting the popular education YouTube channel Vsauce. 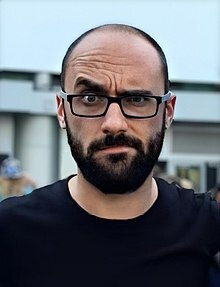 His channel initially released video game-related content until the popularity of his educational series DOT saw discussions of general interest become the focus of Vsauce, encompassing explanations of science, philosophy, culture, and illusion. As the host of Vsauce, Stevens has become one of the most successful YouTubers (with over 14 million subscribers and 1.57 billion views), as well as a leading figure in the Internet-driven popularization of science and education. In 2017, he created and starred in the YouTube Red series Mind Field, and presented the nationwide educational stage tour Brain Candy Live! alongside Adam Savage. Stevens was born on January 23, 1986, in Kansas City, Missouri. His mother worked as a teaching assistant, while his father was a chemical engineer. The family relocated to Stilwell, Kansas in 1991. Stevens graduated from Blue Valley High School, where he developed a comedic personality, as well as a passion for knowledge, participating in informative speech and drama club programs. He then graduated from the University of Chicago with a bachelor's degree in psychology and English literature. As an undergraduate, Stevens became interested in video editing, having viewed a re-cut trailer of The Shining. Under the username pooplicker888, Stevens edited and produced his first video content on YouTube in 2007, with some of his clips being featured by CollegeHumor and Funny or Die. In the same year, as the user CamPain 2008, he began using superimposition and dubbing to produce short comedic films about candidates in the United States presidential election, 2008. Stevens' online content attracted the interest of Ben Relles, who invited him to become a member of the online comedy group then known as Barely Political. Having moved to New York City in 2008, gaining employment with both Barely Political and Next New Networks, Stevens acted alongside comedians such as Mark Douglas, Todd Womack, Andrea Feczko and Amber Lee Ettinger, becoming well known for his role as a bearded nun. He also edited content for the channel and directed a music video parodying Owl City for Douglas' popular The Key of Awesome series. Stevens launched the Vsauce channel in 2010. Initially, it featured many contributors, with a heavy focus on video game culture. Several distinct series emerged, many of which were hosted by Stevens, including V-LIST (video game-related lists), IMG (featuring viral images), DONG (Do Online Now, Guys, showcasing various online games and tools) and LÜT (showing nerdy and interesting products available online). He developed a catchphrase by introducing his videos with "Hey, Vsauce. Michael here". However, it was Stevens' educational content that attracted the most attention. He says he was inspired to create scientific videos by Paul Zaloom's work on Beakman's World. Stevens realised that his most popular content tended to incorporate more serious real-world concepts, often exhibiting interdisciplinarity. Notable examples include: "What is the resolution of the eye? "; "What is the speed of dark? "; "Why is your bottom in the middle? "; and "How much money is there in the world?" Later in 2010, Stevens launched two related channels, named Vsauce2 and Vsauce3, which eventually attained the sole hosts/producers Kevin Lieber and Jake Roper, respectively. By 2011–12, most content relating to Internet and video game culture was delegated to these two channels, leaving the original Vsauce channel hosted and produced solely by Stevens, and devoted to educational discussion. Most videos are titled with a question, which Stevens answers or discusses at length, covering relevant tangents from any educational field that appeal to general interest. I don't want to just create things that are me reading a Wikipedia page, I want them to be a journey – a logic train that makes you go "Oh wow, where are we going today?" In 2012, the year after Next New Networks was acquired by Google, Stevens also began working as a content strategist for Google in London. His role focuses on Google's YouTube platform, including meeting with fellow content creators to optimise their videos' effectiveness. Stevens became an accomplished public speaker. He presented two TED talks in 2013: "How much does a video weigh?" at the official TEDActive, and "Why do we ask questions?" at TEDxVienna. He has also spoken at events for Adweek, VidCon, MIPTV Media Market, the Edinburgh International Television Festival, and for Novo Nordisk as a diabetes educator. In 2015, he appeared at the YouTube Fan Fest in Toronto. Through his work with Vsauce, Stevens has collaborated with and appeared alongside prominent individuals within the scientific community. These include Bill Nye (on "Why did the chicken cross the road? "), Derek Muller (on quantum randomness), Jack Horner and Chris Pratt (on dinosaur studies and Jurassic World), and David Attenborough (in an interview about Planet Earth II). In 2016, former MythBusters co-host Adam Savage stated that he would join Stevens on a stage tour in 2017. Later in the year, Stevens published a video to Vsauce announcing that he and Savage will visit forty cities across the United States in early 2017 to present Brain Candy Live. The tour has been described as a live science-based stage show that is "between TED Talks and the Blue Man Group". A second United States tour is scheduled for March–May 2018. Stevens partnered with YouTube Red (now YouTube Premium) to create and host Mind Field, which premiered in January 2017 through YouTube's paid streaming service on the Vsauce channel. Each episode of the educational series explores a different aspect of human behavior, by hearing from and conducting experiments on Stevens and guests including Dominic Monaghan. Stevens said that he had "pitched Mind Field to many television networks and it [had been] rejected". Stevens moved to London, England in 2012. In 2016, he married his wife Marnie, moved back to America and currently resides in Los Angeles, as does Jake Roper, the host of Vsauce3. In his Field Day documentary, in which prominent filmmakers undertake a project of their choosing, Stevens decided to visit Whittier, Alaska, to investigate the uniqueness of the remote town. ^ "Tweet from Stevens on 30 July 2016". Twitter. 30 July 2016. Retrieved 17 February 2019. ^ VsauceGaming (2012-09-03). "1 MILLION SUBSCRIBERS!". Facebook. Retrieved 2016-10-10. ^ ColorfulPocketsVlogs (2016-07-01). Just Got My Diamond Play Button. YouTube. Retrieved 2016-09-02. ^ a b c d e f g Think Fact (2014-01-23). 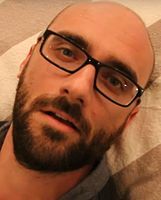 The Story of Michael Stevens, The Man Behind Vsauce. YouTube. Retrieved 2015-09-28. ^ a b Kate Vickery (2015). "Meet The Man Behind Vsauce: Michael Stevens". Faze Media. Retrieved 2016-09-02. ^ Vsauce – YouTube: Videos. YouTube. Retrieved 2015-09-28. ^ Jessica Lahey (2014-10-28). "What Teachers Can Learn From Vsauce's YouTube Show". The Atlantic. Retrieved 2016-09-02. ^ "MICHAEL STEVENS: YouTube sensation aka Vsauce". WME IMG Speakers. Retrieved 2016-09-02. ^ a b c Geoff Weiss (2017-01-12). "Vsauce Drops Trailer For YouTube Red Series 'Mind Field', Premiering Jan. 18". Tubefilter. Retrieved 2017-01-23. ^ a b Blake Rodgers (2017-01-08). "ADAM SAVAGE TALKS UP NEW SCIENCE TOUR BRAIN CANDY LIVE!". Nerdist News. Retrieved 2017-01-23. ^ "MICHAEL STEVENS: WEB VIDEO STAR". TodayBirthdays. Retrieved 2016-09-02. ^ a b c "MICHAEL STEVENS A.K.A VSAUCE". Edinburgh International Television Festival. 2015. Archived from the original on 2017-09-29. Retrieved 2016-09-02. ^ Brady Haran (2013-03-02). "Meet Vsauce". Sixty Symbols. Retrieved 2016-09-02. ^ Robobos (2006-02-27). "Shining". YouTube. Retrieved 2015-09-28. ^ Michael McCrudden (2016-05-05). "V SAUCE – Before They Were Famous – Michael Stevens". YouTube. Retrieved 2016-10-20. ^ a b c "MICHAEL STEVENS: SPILLING THE SAUCE". TenEighty Magazine. 2015-06-07. Retrieved 2015-09-28. ^ a b FootofaFerret (2013-10-26). A Brief History of Vsauce. YouTube. Retrieved 2016-09-02. ^ a b Barely Political (2010-05-14). "ELECTRONIC WUSS: Owl City Parody – Key Of Awesome #20". YouTube. Retrieved 2015-09-28. ^ David Gianatasio (2015-07-19). "10 Viral Content Creators Who Electrify Fans by the Millions". Adweek. Retrieved 2016-09-02. ^ Reddit (2014-04-29). IAMA: Michael Stevens of Vsauce. YouTube. Retrieved 2015-09-28. ^ Eric Blattberg (2014-12-04). "The secret sauce behind YouTube giant Vsauce". Digiday. Retrieved 2016-09-02. ^ Simon Bor (2015-07-02). "Opening Keynote, Michael Stevens: All Change? – Report". The Children's Media Conference. Retrieved 2016-09-02. ^ "Michael Stevens: YouTube educator". TED (conference). February 2013. Retrieved 2015-09-28. ^ Sophie Lenz (2013-09-05). "MICHAEL "VSAUCE": FORGOTTEN QUESTIONS ANSWERED ON YOUTUBE". TEDxVienna. Retrieved 2016-09-02. ^ Robert Briel (2013-03-28). "MIPTV to showcase YouTube originals". Broadband TV News. Retrieved 2016-09-02. ^ Sam Gutelle (2014-10-24). "Novo Nordisk Taps Michael Stevens Of Vsauce As A Diabetes Educator". Tubefilter. Retrieved 2016-09-02. ^ Nick Krewen (2015-03-31). "Google sponsors first North American YouTube FanFest". StreamDaily. Retrieved 2016-09-02. ^ Amanda Walgrove (September 17, 2012). "Vsauce And Bill Nye Dissect The Classic Joke, 'Why Did The Chicken Cross The Road?'". What's Trending. Archived from the original on September 28, 2013. Retrieved April 29, 2013. ^ Derek Muller (2014-07-16). "What is NOT Random?". Veritasium. Retrieved 2015-09-28. ^ Anthony Domanico (2015-06-19). "Chris Pratt and paleontologist Jack Horner crack dino mysteries". CNET. Retrieved 2016-09-02. ^ Lori Dorn (2016-11-09). "Michael Stevens Talks With Sir David Attenborough About Storytelling, Animals and Technology". Laughing Squid. Retrieved 2016-11-13. ^ Paula Hendrickson (2016-08-17). "'Mythbusters' May Be Ending, But Star Adam Savage Sees New Beginnings". Variety. Retrieved 2016-09-02. ^ Morgan Greene (2016-10-24). "'Brain Candy Live!' coming to Chicago". Chicago Tribune. Retrieved 2017-01-23. ^ "Don't miss: 'Brain Candy Live' with Adam Savage (Tested, Mythbusters) & Michael Stevens (Vsauce) / Boing Boing". boingboing.net. Retrieved 5 November 2017. ^ Dan Rys (2016-06-24). "YouTube Announces Mobile Live Streaming, New Original Series". Billboard. Retrieved 2017-01-23. ^ Oravecz, Nora (15 December 2017). "How Vsauce's Michael Stevens Disruptive Pitch Finally Got Approved, and Led Him to His Top Series, Mind Field". Huffington Post. Retrieved 22 December 2017. ^ "Michael Stevens from Vsauce on Instagram". 2016-01-15. Retrieved 2016-10-21. I've moved to LA! There's still a lot to do before I'm totally 'moved', but I'm already holding brains, hanging out with @jakerawr, AND ready to film my next ep! ^ Field Day (2015-05-14). "Home Sweet Whittier: Vsauce's Michael Stevens Has A Field Day". YouTube. Retrieved 2015-09-28. ^ Jen Kinney. "FIELD DAY – JEN KINNEY". Archived from the original on 2016-07-29. Retrieved 2016-09-02. ^ Vsauce (2012-07-14). "The show is #DarkMatters on @ScienceChannel Sat @ 10pm EST I make occasional appearences [sic]! RT @TimidoGeorge: what show? It's online?". @tweetsauce. Retrieved 2017-06-11. ^ TomSka (2013-02-09). "asdfmovie6". YouTube. Retrieved 2016-09-02. ^ Head Squeeze. "How Does Glue Work? (feat. VSauce)". Last.fm. Retrieved 2015-09-28. ^ "America Declassified". TV Tropes. 2013. Retrieved 2016-09-02. ^ James Patrick Casey (2014-01-25). "Super Brainy Zombies – Review". Wordpress. Retrieved 2015-09-28. ^ Evan DeSimone (2014-06-18). "Blinding Us With Science: Vsauce Drops Knowledge Bombs on 'Jimmy Kimmel Live'". New Media Rockstars. Retrieved 2015-09-28. ^ "VSauce Sauce: Jamie Oliver & Michael Stevens". JamieOliver.com. 2015-03-01. Retrieved 2015-09-28. ^ 2Paragraphs (2016-08-03). "Who Is Guest Judge Michael Stevens on 'BattleBots'?". Retrieved 2016-09-02. ^ "VIDEO VISIONARY AWARD – EDUCATION RECIPIENT: VSAUCE". RealPlayer Video Visionary Awards. 2013. Retrieved 2017-01-23. 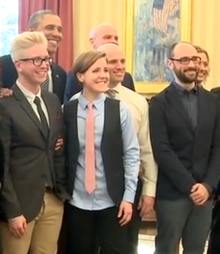 ^ "2014 People's Voice VSAUCE". Webby Awards. 2014. Retrieved 2015-09-28. ^ "4th Annual Streamy Awards Winners & Nominees". Streamy Awards. 2014. Retrieved 2015-09-28. ^ "5th Annual Winners & Nominees". Streamy Awards. 2015. Retrieved 2015-09-28. ^ "2015 People's Voice VSAUCE CHANNELS". Webby Awards. 2015. Retrieved 2017-01-23. ^ "2016 People's Voice VSAUCE NETWORKS". Webby Awards. 2016. Retrieved 2017-01-23. Wikimedia Commons has media related to Michael Stevens (educator). This page was last edited on 22 March 2019, at 03:14 (UTC).